Christina Banerjee, is a painter and mixed media artist born and brought up in Alabama, USA that currently resides in New Delhi, India. After moving to India, Christina has been inspired by her radically different surroundings, waking up each day to the sound of noisy crows and pigeons. She has never been this close to elephants, birds, and monkeys, without ever having visited the zoo. 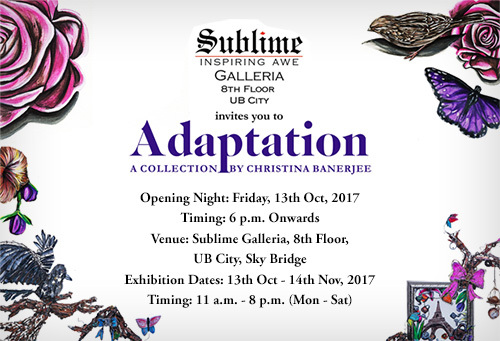 Adaptation, is a series that depicts animals through an amalgamation of her thoughts and experiences from her life in the US and India, and her travels across the world, thus far. Christina says, "I want people to take away from my art a sense of humanity, to appreciate the beauty of these creatures and perhaps instil a thought for what we may be doing to them. The most gratifying for me as an artist, is to be able to convey my thoughts to the viewer while allowing for their own interpretation. In this way, every viewer is, in a sense, looking at every painting a little differently." She signs off saying, "My professional life, in its entirety, has been consumed by art and I derive immense satisfaction from it."